Some things in this film call for a willing suspension of disbelief. A man turns into a wolf at night. A woman turns into a hawk by day. Centuries before the science of dentistry was common, everyone has straight, white teeth. Matthew Broderick is a streetwise thief. 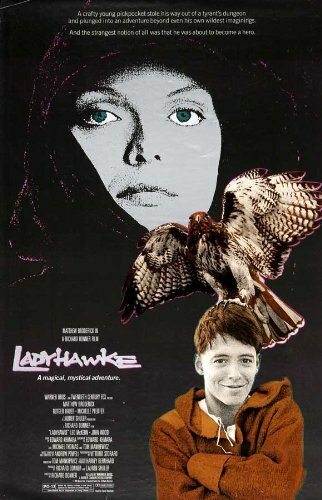 Here at Movie Churches, though, the biggest stretch may be Ladyhawke’s presentation of the medieval church. 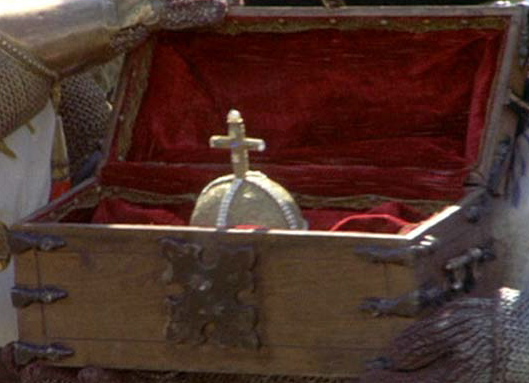 The film is set in 13th century … um… Europe? in everybody’s favorite capital, Aquila (not coincidentally, Latin for ‘eagle’). There doesn’t seem to be any secular government, power, or authority of any kind. “The Bishop” seems to be the sole authority in this country (Region? Fiefdom? Parish?) 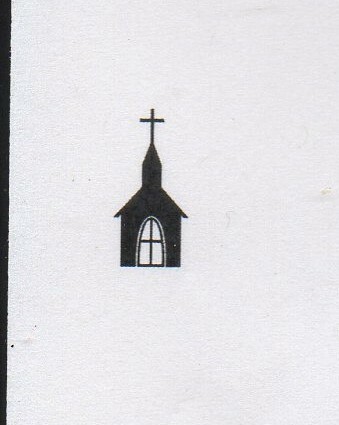 The Bishop has soldiers under his command, and the prison is located in the church. Mention is made of the Vatican (the good knight, Navarre, talks of his family defending the Holy See), but we never see anyone who has authority over the Bishop. The film opens with prisoners awaiting execution in cells below a cathedral where a Mass is taking place. There are families and monks at the service, including a small child. Masses in this film are different than any I’ve seen in the contemporary Catholic Church. There is no sign of the Bread or the Cup, which is kind of, you know, what the Mass is all about. Instead, the service seems to consist of monks marching around chanting. As the service proceeds, a prison break is taking place downstairs. The thief, Phillipe Gaston the Mouse (Matthew Broderick), escapes through the secret passages of the prison and comes up to the floor of the church, where he is seen by a little girl. He manages to make his way outside. The Captain tries to assure the Bishop the escape of one petty thief is nothing to worry about, but the Bishop responds, “A storm begins with a single breeze; so a rebellion begins with a single act.” (The Bishop is upset that the people are not paying their “taxes” to the church, just because they don’t have anything to pay their taxes with.) So the Bishop demands the apprehension of the Mouse. As the Mouse attempts to elude the Guard, he carries on a conversation with God, promising to amend his ways if God allows him to escape. 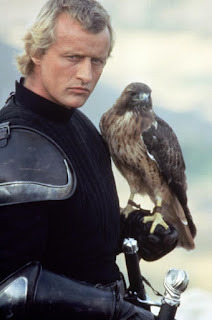 And aid comes from an unexpected source, in the form of Navarre the Knight (Rutger Hauer), the former Captain of the Guard. Navarre is a personal enemy of the Bishop, and he’s accompanied by a hawk that occasionally rests on his shoulder, flies free, and attacks the Bishop’s soldiers when needed. When a soldier shoots the hawk with an arrow, Navarre is distraught. 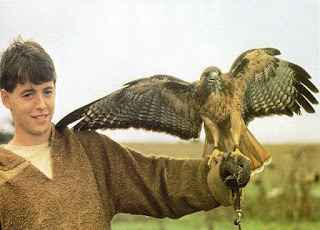 He demands that Gaston take the hawk to a monastery where Imperious (Leo McKern), who seems to be a mad monk, lives. Gaston does, and the monk offers to cook the hawk for them to share a meal. 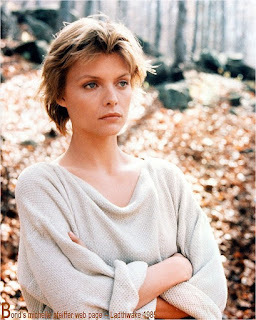 When he learns the hawk came from Navarre, though, he carefully cares for the bird, and when the sun sets, the wounded hawk transforms into a wounded woman (Michelle Pfeiffer). Gaston demands an explanation from Imperious. The Bishop cursed the knight to being a wolf during the night and the woman to being a hawk during the day. They would never be together in human form. The knight wants revenge on the Bishop, but the mad monk has an idea about how the curse can be reversed. Of course, at Movie Churches we’re not here to evaluate films, but the clergy and church in films. If I was talking about this Richard Donner directed film, I would have to point out that it features three of the more interesting stars of the ‘80’s. Rutger Hauer may not have ever become a huge star, but Roy Batty, the replicant from Blade Runner, is one of my favorite characters in the movies. The young Matthew Broderick from War Games is topped only by the young John Cusack as one of the most appealing of movie’s youths. And Michelle Pfeiffer… Well, she is always stunningly beautiful and yet down to earth, intelligent, and charming. And the film is great fun. But any positives from Imperious are wiped away by the evil Bishop. He lusts after a young woman and is willing to go to any lengths to keep anyone else from having her, whether that means murder or a deal with the devil. It is made even more nauseating because the Bishop insists that the things he does are all part of the will of God. He claims that God speaks to him (Gaston is puzzled by this, “I talk to God and he’s never mentioned you.”) The Bishop earns our lowest Movie Church rating of One Steeple. It’s tempting to say the Bishop is over the top, but I read the news about the sexual abuse and the coverup of that abuse in the Catholic Church. 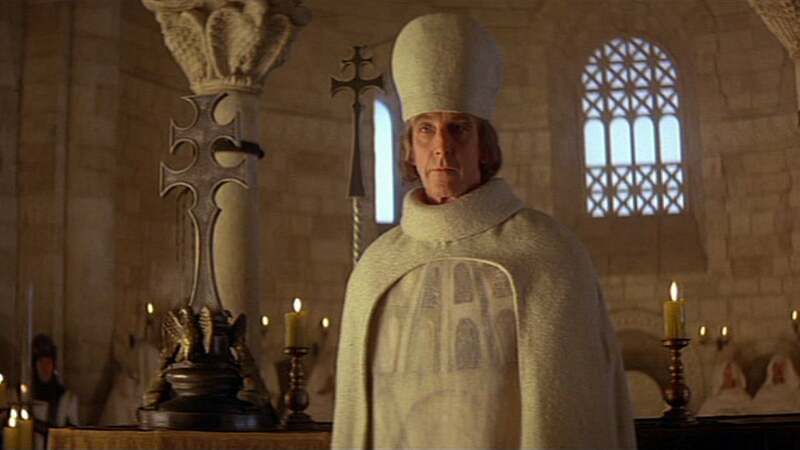 The Bishop of Ladyhawke’s schemes seem almost quaint. 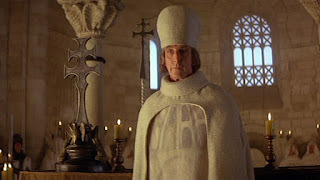 One can cheer for the downfall of the Bishop in Ladyhawke while taking encouragement from Gaston’s active faith. The actions of real Bishops in the world has destroyed the faith of many, and will do more. In the movies, at least in ‘80’s films, a happy ending was a sure thing. I have faith that the God of Scripture has promised His justice is even more sure. When people think of art films -- if they think anymore these days of “Art Films”-- they may well think of Ingmar Bergman’s The Seventh Seal as the quintessential art film. It’s Swedish, it’s black and white, it uses a lot of symbolism, and it’s philosophically existential, with a literary reference for a title (taken from the Book of Revelation, chapter 8). The film brought Bergman to prominence outside of Sweden, and he is now regarded as one of the greatest of all filmmakers. The film isn’t a stale old classic. It has grim aspects, but it also has wonderful actors playing appealing characters, and there is even humor to be found in the film. The Seventh Seal has become a subject of parody through the years, so I’m sure many people are more familiar with the parodies than the original. In Bill and Ted’s Bogus Journey, Death challenges the dim boys to a game -- with their souls at stake -- and they play Battleship, Clue and Twister. 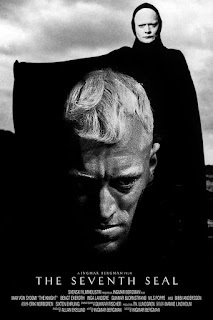 The scene’s a spoof of the famous chess scene in The Seventh Seal where the Knight, Antonius Block (Max von Sydow), challenges Death to a game of chess. 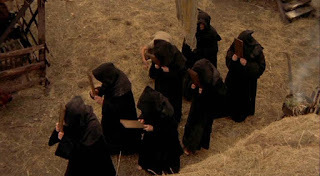 In one scene toward the end of Monty Python’s The Meaning of LIfe, Death comes to a dinner party, clearly paying homage to one of the final scenes of The Seventh Seal. 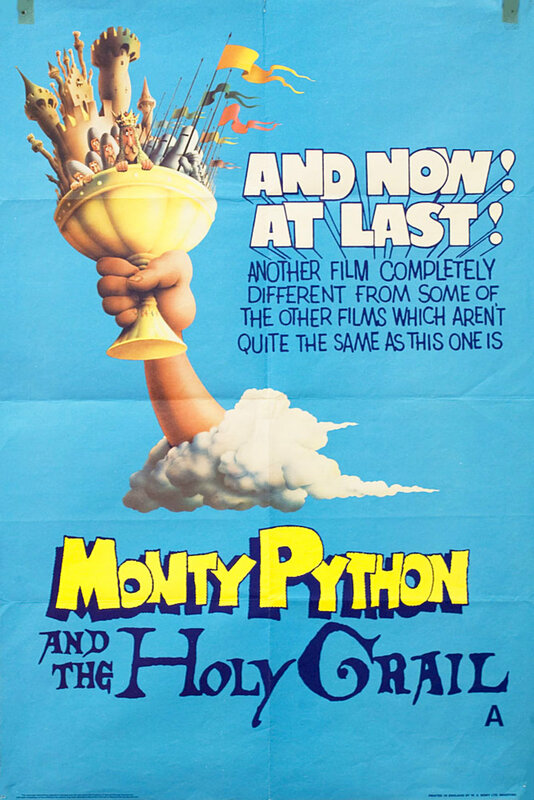 But more to the purpose for us here at Movie Churches, a scene in Monty Python and the Holy Grail (recently reviewed here) clearly echoes a scene from The Seventh Seal. Both films have processions of self-flagellating monks. In Holy Grail the monks were hitting themselves on the head with boards. 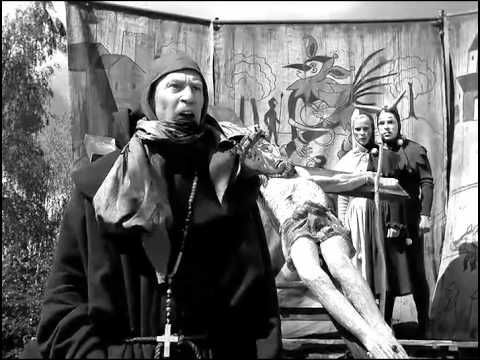 In The Seventh Seal, monks march with peasants (a man on crutches among them); as they walk, some whip others’ backs. There is wailing, and someone is wearing a crown of thorns. They also carry a large crucifix before them. Not the most encouraging of sermons. 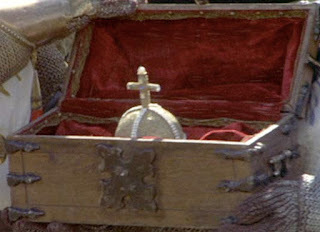 It is understandable that at the time of plague, the Church would discuss death, but in this film, the church makes death the focus of everything. 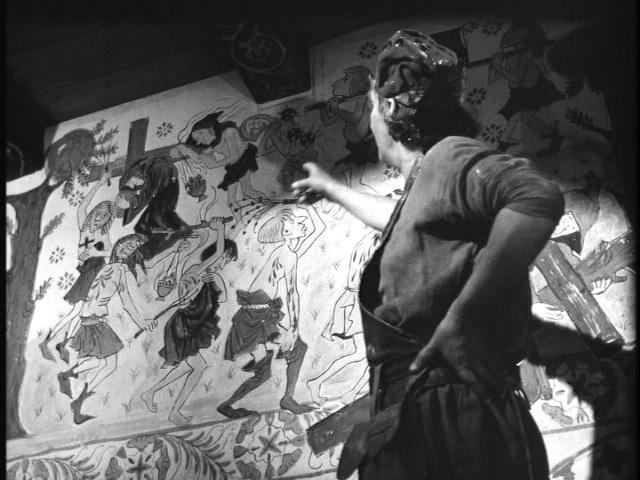 We see a man in a church painting a mural that the priest ordered. The subject is “The Dance of Death.” The priests also hire a troupe of actors with death masks to perform on the church steps in Elsinore for the Saints’ Feast. 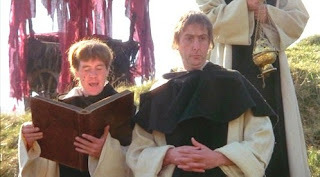 One of the actors says, “If priests didn’t pay us so well, we’d turn them down”. Scripture teaches that death came into the world through sin (see Genesis chapter 3), but when Jesus was asked who was to blame for a man’s blindness, the man or his parents, Jesus said neither. Even his blindness was to be a means of bringing glory to God. And He healed the man. That is nothing like the message of the church in this film. Antonius Block goes to a church to seek God. He goes before the crucifix and tells God to reveal Himself through Block’s senses. The knight wants to see God, but He isn’t visible; hear Him, but He is silent. Block goes to confess to a priest, but the priest is actually Death in disguise. As Scripture makes clear (in First Corinthians 15), Death is the enemy. 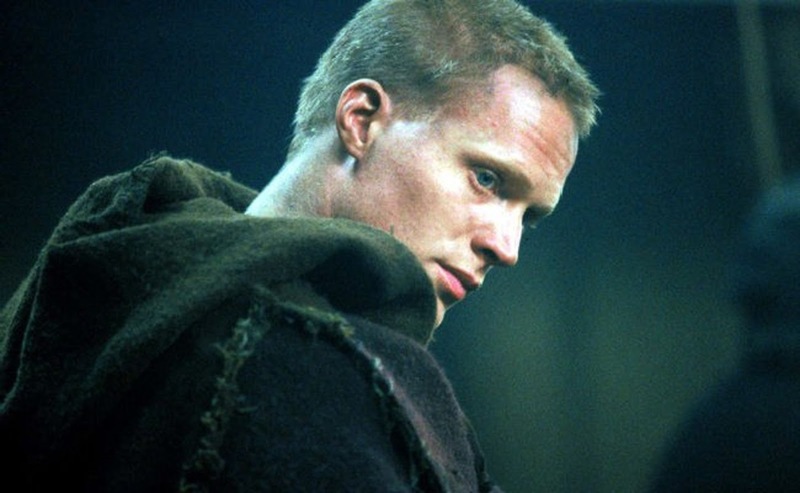 Block says of his inner struggle, “Faith is a heavy burden, it is like loving someone you never see.” And the knight knows about loving someone you don’t see -- he went off to the Crusades for ten years and when he returned, he didn’t know where his wife was. Yet at the end of the film he finds his wife. So is there hope in putting faith in a God one doesn’t see? 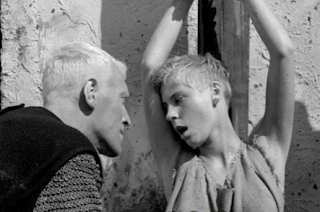 In later films, Bergman is even more pessimistic about the existence of God, but in this film, there are -- possibly authentic -- visions of the Virgin Mary and Jesus. In Block we have a character who wrestles with God and accomplishes good. 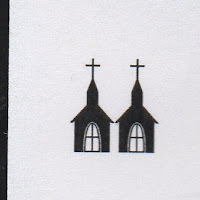 Nonetheless, the best the church and clergy in this film deserve is a two steeple rating. 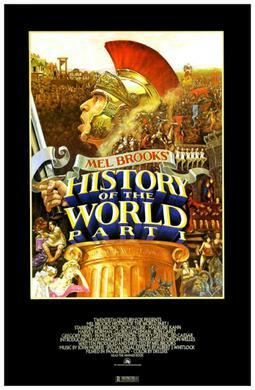 There’s there's a Mark Twain quote, "Humor is tragedy plus time,” that Mel Brooks quoted when talking about the Spanish Inquisition sequence from his film History of the World Part I. Some might argue that people being tortured for their religious convictions is nothing to laugh at, but this time period has been used for comedy before. 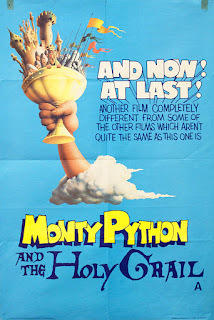 Last week, we looked at Monty Python and the Holy Grail, and on the Pythons’ TV show (Monty Python’s Flying Circus), the group did a skit about the Spanish Inquisition that no one expected. Brooks plays Tomas de Torquemada, a Castilian Dominican friar, who began as a regular inquisitor in 1482, but was appointed by the Pope as the Grand Inquisitor the next year and served until his death in 1498. Both Jews and Muslims were “encouraged” to convert to Christianity. All manners of persuasion were used to encourage conversion, including counseling, lecturing, and, most infamously, torture. Those chained to the wall can’t fully participate in the dance, but they do what they can. We also see nuns strip down to swimsuits for the big pool numbers. Jews are thrown in the pool, but they drown. Someone asks the Inquisitor if there were any converts today. “Nah, not a one,” he answers. Though told through comedy, Brooks and the Pythons are keeping the memory of the Inquisition alive. It’s important to remember the horrors that were committed in the Name of Jesus, but it should be noted that the films don’t tell the whole story. In fact, many who tell the story these days don’t tell the whole story. Initially, governments, not the Church, were persecuting the Jews and Muslims. The Catholic Church believed Muslims and Jews were being treated unfairly and believed the Church would be more accurate arbiters of faith than Kings. They did treat Jews and Muslims better than the civil governments did, it’s just that by our standards, both were horrors. I’ve linked to where you can see this argument made. 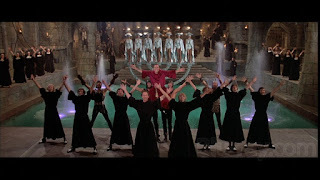 But as for the way the Catholic Church and Friar Torquemada are presented in this movie, they receive our lowest Movie Church score of One Steeple. 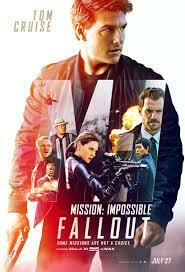 Mission Impossible: Fallout, the sixth film in Tom Cruise’s popular series (based on the over fifty-year-old TV show), has been #1 at the box office the last two weeks and may be again next week. There’s not a lot of church in the film, and the little that’s there has nothing to do with the star’s church of choice, Scientology. No clergy are featured in the film. I’d wager most film goers wouldn’t recall that an important theme of the film is religion -- one scene takes place in one of the world’s most iconic sanctuaries. That’s fine. Reminding people of such things is one of the reasons Movie Churches is here. The film begins, as these stories do, with a mission that IMF (Impossible MIssions Force, not the International Monetary Fund) leader, Ethan Hunt (Cruise) must decide whether to accept. As often is the case, he’s asked to stop a terrorist plot. 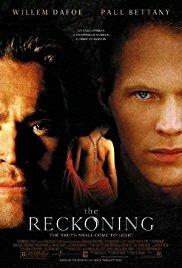 The terrorist is described as an anti-religious zealot whose first targets are the Vatican, Jerusalem, and Mecca; the gang of terrorists call themselves “the Apostles.” Not much is made of this motive as the film goes on, as the terrorist seems to become more fixated on a personal vendetta against Ethan Hunt. I wondered what the filmmakers thought of the terrorists’ cause. Is being “anti-religious” like this terrorist a bad thing? Is his cause just, but his methods are bad? The film never really wrestles with issue. As for the scene in the church… Sorry about this spoiler, but there’s a scene where Hunt is chasing a bad guy through the streets of London while being chased himself by other bad guys. (Hope I didn’t give too much away there.) Hunt runs into St. Paul’s Cathedral while a service of some kind is in progress. Maybe it’s a state funeral, since all the seats of vast sanctuary are filled with an elegantly dressed crowd that includes representatives of the military and perhaps some of the royal family. When Hunt barges into the proceedings, followed by armed thugs, everyone remains politely seated. Hunt apologizes to the congregants before dashing off. One of the selling points of these films, like Bond films before them, is the opportunity to see some of the world’s most beautiful sights. St. Paul’s is certainly a gorgeous edifice, and it’s a cute little scene, if not at all realistic. I know, it’s shocking there would be something in these films that doesn’t achieve perfect verisimilitude, but here it is: in one of England’s great national landmarks, no one has given a thought to security. In the wake of church shootings in the United States, most congregations have paid some attention to plans in case of a shooter scenario. Surely, in one of the most famous churches in the world, the leadership has given this some thought, and their plan would not be to have everyone sit quietly, looking polite but perplexed when a group of threatening men enter the building and go to the altar. Even aside from security plans, surely the military officers in the congregation would instinctively take action. The film is a great summer action ride, with marvelous stunts and set pieces. 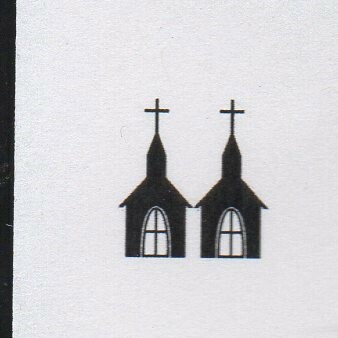 As for the church in the film, until the cinematic St. Paul’s improves its security, the best we can give it is Two Steeples.